Set against a breathtaking mountain backdrop, Kalkan sits on Turkey’s stunning Turquoise Coast: a cosmopolitan, vibrant resort perfect for exploring the timeless beauty of ancient Lycia's pine-clad shores. The pretty town centre is a treasure trove of narrow streets, whitewashed Ottoman Greek houses and inviting boutiques. It's also famous for its harbourside lounge bars and rooftop restaurants serving a variety of delicious food with impeccable service. Our guests return to Kalkan year after year. To find out why, visit our collection of luxury villas and hotels – and, if you book your 2019 Kalkan holiday with Simpson Travel, we'll include a complimentary hamam experience and a day trip along the Turquoise Coast in a traditional wooden gület. * Prices include seven nights’ accommodation, flights and transfers/car hire, based on the lowest rate for maximum occupancy. "Villa Lapis is one of the best villas we have ever stayed in. The view is astonishing and the quality of the property is outstanding. Simpson Travel took great care of us…"
"This was our first visit to Turkey and to the Korsan Suites and it definitely won't be our last either. The Korsan Suites are wonderful, but the manager Memduh and his team make your stay at Korsan exceptional…." "We have just returned from a beautiful week at the Kalkan Regency… Not only is this hotel beautiful, but the winning formula is the kindness and gentleness of the staff... We are already planning to return next year!" "As always it was a pleasure to book with Simpson Travel – a smooth journey. Villa Balik is beautiful with wonderful views... the perfect tonic!" "It was wonderful as always with Simpson Travel, who will always be our first port of call when looking for another fab holiday. Thanks for helping us have a super time with our two grandchildren, they loved it." Between soaring mountains and an impossibly blue Mediterranean Sea, lies the land of the Lycians – an ancient people whose tombs now dot this rugged, Homeric landscape. The Persians, Athenians and Romans each had their hold over Lycia, the ruined architecture of the latter still delighting unsuspecting visitors at many a turn along many a trail. The best known, and arguably most scenic, of these is the Lycian Way – a 310-mile tying-together of goat tracks and timeless paths, which traverses deserted beaches, lush forests and soaring peaks. Here, at its south-westerly sweep, it skims to touch a jewel of Turkey’s shoreline, the aptly named Turquoise Coast. 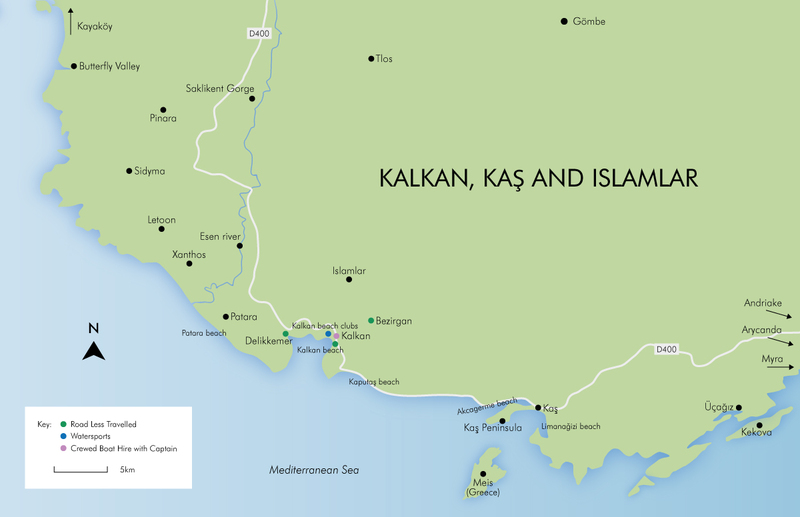 Of all the settlements along these shores, Kalkan is one of the youngest. The original town's folk were Ottoman Greeks, who settled about 200 years ago and used this pretty bay to trade in silk, amongst other things. Today’s Kalkan favours the tourist over the trader, though mulberry trees – residence of choice for silk worms – continue to dot granite-paved streets in sophisticated memory of the past. From a harbour edged with stylish eateries and Ibiza-esque chillout bars, narrow lanes lead to numerous restaurants, some of them rooftop and offering the best seats in the house for watching the sunset. Just a few miles west of Kalkan sits one of the longest – and surely most perfect – of the Mediterranean’s beaches. A silver hem to aquamarine sea, Patara beach boasts eight miles of coastal bliss backed by ancient Lycian ruins (in case the sunsets weren’t incredible enough). Nestled high in the foothills of the Taurus Mountains, the village of Islamlar seeks solace from the heat – and from the pace of life in the busier dwellings of the world below. Here, a village moves to its own rhythm – never courting attention, but attracting it nonetheless through tireless traditions, renowned hospitality and unbeatable views across fertile valleys to the white sands of Patara, far away. Islamlar is Turkish countryside living at its beautiful best. A place where the tea gardens are somehow a touch more tranquil than elsewhere, and where pools fed by natural spring water are brimming with trout of such quality, the village’s restaurants are justly famed for miles around. A little farther to the east, and a little richer in history, lies the market town of Kaş. It dates back to around 4 BC and offers lots to ponder over during a sundowner along the palm-lined esplanade – the perfect vantage point for taking in the comings and goings of the local fishing boats as they weave between luxury yachts and traditional gülets. Take to the water yourself and you might glimpse an ancient sunken city, while a wander up to higher ground might reveal the Lycian rock tombs. When the day's exploring is done, find one of the many cafés or tea gardens to dine alongside the locals in an atmospheric setting with a cool bohemian vibe. ‘Fusion’ is invariably the theme when eating out in Kalkan, with Turkish flavours influencing contemporary dishes from far and wide. For more traditional fare, head out of town to the areas in and around Islamlar and Kaş and look out for gözleme – thin layers of dough, with a savoury or sweet filling. At the heart of Turkish cookery is the concept of meze: small hot and cold dishes, invariably vegetarian, which are full of tantalising tastes, and served alongside irresistible dips ahead of the main course. When morning rolls round again, you’ll find breakfast is given a bigger billing here than it perhaps gets elsewhere, with bread, eggs, cheese, tomatoes, olives, yoghurt and honey all having a place on the table. Throughout Turkey, you’re never far away from a glass of warming ay tea, grown on the shores of the Black Sea and served black and strong in small, tulip-shaped glasses. Cooling, yoghurty ayran is a great accompaniment to pide (Turkish bread) and pancakes, or if you’d prefer something alcoholic, try a refreshing Efes, Turkey’s most popular beer. However, if you’re tucking into a fresh fish dish, act like a local and choose an aniseedy raki on the side. In Kalkan, some of the best food – and cooler breezes – can be found atop the buildings at one of the town’s numerous rooftop restaurants, full of atmosphere and often with live jazz to give your evening a particularly laid-back vibe. And the waterfront never disappoints, with sofa-strewn cocktail bars luring those looking to enjoy an aperitif amid a sassier atmosphere before crossing the path to dine at the water’s edge. Set in higher and cooler climes, Islamlar's restaurants invariably offer freshwater trout, the local speciality. Breakfast in the village is another must-do, sitting out on a terrace and enjoying valley views as sublime as the local yoghurt and honey dishes themselves. Kaş is your destination for a more intensely Turkish culinary experience: a vibrant place where locals and visitors dine side by side at the wonderful selection of restaurants in the Old Town. The most local option of all, though, must surely be to invite a chef to cook for you at your villa. Dine under the stars without so much as a whisper of ‘Who’s driving?’. This pebbly beach is ideal for families with young children. A natural freshwater spring feeds into the salt water for a cooling effect, popular with the occasional passing turtle. The beach is just past Kalkan’s harbourside and parking is available. There are sunbeds and umbrellas for hire, harbourside restaurants nearby and cafés behind the beach. A truly stunning crescent of shingle and sand surrounding turquoise water, set at the mouth of a short gorge. You must negotiate 180 steps along the way, but the effort is well rewarded. Kaputaş is a ten-minute drive to the east of Kalkan, along the road to Kaş. All buses leaving from Kalkan for Kaş will stop here. Sunbeds, parasols and a snack bar are available at peak times, but arrive early as the beach gets busy between June and August. Renowned for its 12km of soft, golden sand and for being the site of recently excavated ancient Lycian ruins. The beach is a protected breeding ground for both loggerhead and green sea turtles. Patara is a 15-minute drive west of Kalkan, 40 minutes from Kaş and 25 minutes from Islamlar. Simple but adequate facilities are available, with changing rooms at the eastern end of the beach. To protect the Caretta Caretta turtles, which nest in the sands, the beach is closed between 7pm and 9am. Accessible by boat from Kaş harbour, Limanağizi is a shingle beach that’s popular with Turkish visitors. Four beach clubs share this beautiful stretch of coast and there are good restaurants on the beach. A free boat service leaves regularly from Kaş harbour during the summer months. Take some change as there are charges for umbrella and sunbed use. A sheltered shingle cove that shelves gently into the sea, making it perfect for families with young children. The beach is run by the Tourism High School in Kaş and benefits from full facilities. Akcagerme is on the inside bend of the Kalkan to Kaş road, 20 minutes from Kalkan and five minutes from Kaş. A grassy play area attracts peacocks and chickens and there are some small waterslides for children over the age of eight to enjoy. For beach, read stylish deck – a wooden or rock shelf overhanging the sea, with stunning views and easy access to the water below. Swim out to a nearby pontoon or remain on deck and soak up the faintly Ibizan vibe. There are seven of these waterfront terraces in Kalkan and even more gracing the seafront in Kaş. Simpson Travel guests have complimentary entry to the Indigo Beach Club in Kalkan; otherwise a 'per person' entry fee is likely to apply. Experience the full beauty of the Turquoise Coast from the other side of the coastline. A boat trip offers the chance to explore hidden coves while an evening cruise aboard a wooden gület comes complete with dinner before a sunset fading to gold. The narrow, bohemian streets of Kalkan offer a perfect few hours’ wandering, browsing and people watching. Here, a laid-back, lounge-bar atmosphere buzzes quietly below the town’s famed rooftop restaurants. The Sunday Times voted it one of the top ten best walking trails in the world and the stunning 509km Lycian Way, stretching from Fethiye to Antalya, passes through Kalkan and Islamlar offering extraordinary views and blissful solitude. Kaş may have once been a Greek village, but it oozes Turkish charm. Walk the pretty streets, just half an hour from Kalkan, and soak up the atmosphere of days gone by. Don’t miss the ancient sarcophagus (or King’s Tomb), still standing in the centre of the Old Town as a reminder of a civilisation passed. The ruins of Patara, 15 minutes from Kalkan, are one of the most important archaeological sites in the eastern Mediterranean. The city, said to be founded by Patarus, son of Apollo, is slowly being rediscovered, with finds so far including a theatre, chapel and the triple arch of the city’s gates. This 300-metre-deep canyon, 40 minutes from Kalkan, was cut into the earth by an icy river. Most begin the enchanting walk here by crossing a bridge, though the adventurous opt to wade through water. Hammocks over the water offer the chance to relax, while river rafting provides the action. Set amid a beautiful landscape, the UNESCO World Heritage Site of Letoon was a sacred centre in ancient Lycia and administered by nearby Xanthos. A well-kept secret, it’s rarely visited, other than by terrapins basking in the sun. Xanthos is a 20-minute drive from Kalkan. For child-friendly archaeology, a visit to the half-submerged ruins off Kekova island makes for a novel few hours. Driving (a little over an hour) to Ucagiz and taking a leisurely boat trip is the way to make a day of it, enjoying the beautiful scenery every inch of the way – or you can book a boat trip from Kaş. An hour from Kalkan, on the banks of the Demre River, lies the recently excavated Lycian city of Andriake and its perfectly preserved features, including the city bath, a bazaar and various synagogues. A Roman-era granary, built in 129 AD, is home to the insightful Museum of Lycian Civilizations. Men who prefer an olive-smooth face are in the perfect place to experience a traditional Turkish shave. Head to Kalkan or Kaş for the real deal – complete with a cut-throat razor, flames, heady balms and a hearty slap round the face. With its quaint tea house and ancient bakery (where flour is still ground by millstones), sleepy Islamlar is a fitting place for breakfast. Enjoy yoghurt and honey with stunning views while shepherds herd sheep between the olive trees. It's well worth the 15-minute drive from Kalkan. Celebrating the first assembly of the modern Turkish Parliament, combined with National Children’s Day, celebrated in schools. The highly patriotic Commemoration of Ataturk Youth and Sports Day, with performances from local children. Ramazan, the Islamic Holy Month, a time for prayer and reflection, during which Muslims fast between sunrise and sunset. Dates change every year. Kaş Festival – Art, ballet, music sometimes in an ancient theatre, and a swimming race between Meis and Kaş. Dates change every year. A three-day national holiday called Ramazan Bayrami: the Sugar Feast. Lots of sweet treats are enjoyed, children receive small gifts and cards are exchanged.Dates change every year. Victory Day is a very patriotic celebration of the end of the Turkish War of Independence. The eve of the Feast of Sacrifice, a four-day celebration of charity and compassion for the less fortunate. Republic Day commemorates the creation of the Turkish Republic in 1923 and is marked by processions and fireworks. May brings the arrival of colourful bee-eaters to the region – a brief pit-stop as the birds journey north for the summer. In the early evening, they can often be seen in plentiful numbers performing synchronised displays over the villages, before taking to the cedar and mulberry trees to devour their catch. Enjoy the show over a sundowner – and listen for their distinctive call as the backing track. As everyone leaves Patara beach at the end of the day, join a handful of ‘those in the know’ who arrive around 6pm to experience this glorious stretch of coastline free from crowds. In the cooler evening air, take the opportunity to wander ancient ruins – including the recently excavated Parliament Building – and take an evening dip as the sun disappears over the horizon. Set on a high, fertile plateau, the cooler climes of Bezirgan village make it a popular destination for Kalkan’s older population – especially when the mid-summer sun is at its hottest. This is a place to experience local traditions still going strong and to take a moment or two in relaxing tea gardens. Early morning swims at Kalkan beach should be compulsory! Arrive before the sun comes up over the hill and you’ll find the warm sea water mixed with cooler freshwater springs to be the most invigorating way to start the day. Look out for local wildlife while you’re swimming; green sea turtles bobbing up for air and kingfishers flying at low level across the water are pure magic. It was the Romans who harnessed Lycia’s year-round mountain spring water by building aqueducts to supply their flourishing cities on the lower land. Some of their finest work can be seen at Delikkemer, between Islamlar and the ancient site of Patara, where a huge stone structure spans the dip in the hills. Surrounded by untouched olive groves, this is the ultimate picnic spot.